Our flagship beer in the Humidor Series is Humidor Series India Pale Ale. We start with Jai Alai IPA as a base beer and add the cedar during secondary fermentation. The cedar provides a perfect balance with the assertive hops of Jai Alai to create an entirely new experience. 750ml bottle poured into pint glass on 3/30/11. My first ever Cigar City beer. This ale pours with an amazing orange hue topped with a creamy off-white head. Great retention and amazing lace. The nose of this IPA is great for the style and adds a uniqueness I've never experienced before. Citrus hops, honey, a touch of pine... and CEDAR. You can smell the cedar- faint at first but after a few good sniffs it's there. As I take my first sips I immediately appreciate the balance between the sweet honey notes and the slight bitterness from the pine and citrus notes. Of course the cedar-aging is present and plays along with the other flavors nicely. My only complaint is how long the cedar wood lingers in the mouth. It's good at first but becomes overwhelming by the end of the glass. Medium body and medium carbonation. My overall impression is this beer is fantastic and I loved it all the way (aside from too much cedar) and is a top 5 IPA in my opinion. Thanks Jusitn for sending this my way! A- Body is a very translucent, nearly opaque dark orange hue. Pours with a very nice 2-3 finger foamy white head which settles nicely at 1/2 finger and leaves plenty of lacing behind in the glass. S- Citrus, mango, pineapple, caramel, and a slightly woody background. I would say that the pineapple is most prominent. There is also an accent of pine hops in the nose. T- Initial flavor is filled with exotic fruit, citrus and an accent of pine hops, with actually-a slightly bready yeast backbone. The finish is interesting as the pine flavor comes through a little bit more, as well as pineapple and exocitc fruit sweetness, and a light wood flavor- the hops then the hop bitterness kicks in and lingers on at a moderate strength for awhile. M- high tingly carbonation-and a very prickly, but very smooth, medium weight body-very interesting and good. D- This is a very interesting brew overall. Its fantastic-but it has way too much pineapple for my tastes (which really isnt all that much)- which brings it down to just very good. I give this beer a lot of credit for pulling off both the fresh hoppy characteristics of a fresh IPA and the smooth mouthfeel of a barrel aged, bottle conditioned beer-this is a very good, complex IPA overall. Upon pouring the beer produces a very fluffy off-white head. The head sticks around for some time until becoming a ring that produces some wonderful lacing. The beer smells interesting. The hops and cedar both come out in the nose and prodce a light grapefruit smell. There is an initial sweetness in the beer that is countered by the hops and cedar together. There is perceptable grapefruit, but the cedar and hops working in chorus are very interesting. At first it felt like I was slurping a beer from a humidor, but when the beer breathed a little it came together. I blame my overzealousness. In the mouth it is nice and smooth, even creamy. The carbonation helps prepare your tongue for a nice hoppy kick. Hell, yes this beer is drinkable. It is a very refreshing drink by the pool on a warm day. I see why this was released this time of year. Poured from 750mL bottle into a pint glass. FINALLY, I get to drink this from a bottle. I had this on tap during a Cigar City event at Capone's during Philly Beer Week, but wasn't reviewing at the time. The first bottle I got in trade, I busted. :( So alas, I finally get to do this. Beer pours a very murky golden-orange. Nearly opaque, which is odd for a beer that's not black (stout, etc). The head on this is voluminous, especially when pouring down the center. Very thick and creamy. Resembles the top of a rootbeer float. Head has serious staying power and provides copious amounts of lacing as it receded down the glass. The nose is heavy on the cedar. Not surprising considering it's the big draw. Usually I notice notice any maltiness in an IPA on the back end of a sip, and in the aftertaste. However, it's right in your face in the nose of this beer. The taste is a wonderful combination of hoppiness, cedar, and that maltiness I spoke of. I would prefer a little more hope and cedar, and a bit less maltiness, however. The mouthfeel is a bit smoky, with a good bit of bitterness. The malty overtones of this beer persist from the nose, straight through to the finish. Overall, this is a fabulous twist to the stock Jai Alai. Each taste is a sip of beer and a draw from a cigar at the same time. Nice treat. Glad I have 2 more in the fridge. Pours a clear golden color with a decent sized white head that slowly fades to a ring around the top of my glass. Smells like that old chest at the end of your grandmothers bed. Earthy and woody with a hint of patchouli. There's some citrus in there as well, and maybe some malt, but the cedar is such a powerful aroma its hard to find anything else. It tastes just like it smells. Cedar and citrus with a hint of pepper and malt splashed in for good measure. I'm not sure if I'm imagining this, but after each sip my pallet seems awash with the flavor of cannabis. Medium body with a moderate level of carbonation and a sweet bubbly mouthfeel. The cedar flavor and aroma is quite strong here and the first few sips were rough until my taste buds finally cried uncle. This is not something I would drink often, but I applaud the result. Pours a very pretty orange hue, resembles apricots to me, but I'm mildly colorblind, so who knows! I like the color but the head is only decent so I can't give this a 5. The smell is very boring, some mild piney hops and presumably cedar, and definitely didn't impress me as I tilted the glass back for the first time. The taste, on the other hand, is pretty impressive. A very good balance between the moderate citrus hops and the cedar keeps the beer from getting in to hop bomb territory. I'd be very interested to try the normal Jai Alai to see how these good hops taste when they're on their own. The mouthfeel is very good, a nice amount of carbonation gives the beer some life in the mouth. Drinkability started out pretty high but it definitely feels boozier as you get down the bottle. Unfortunately for all other IPAs, the standard to me is Pliny and it's pretty damn hard to come close to PtE in drinkability. Overall, a solid buy and one I might revisit later after I've tried the regular IPA. A late night xmas bottle with my boy onix1agr. Poured into duvel snifters. A- three huge fingers of fluffy sticky head that holds wonderfully. Head very slowly recedes leaving tons of sticky chunks on the glass and a large floating island. Hazy deep orange in color with a light red hue. One of the best looking brews I've ever had in my hands. S- tropical and citrus fruits with a very floral slightly sweet touch. Hints of yeast. T- satsumas and ruby red grapefruit with some powered sugar on top. I get a bit of honeysuckle and camemille Good bitter hit that rolls into a creamy sweetness and a touch of vanilla. M- a few notches above medium in body with a bit of slickness to it. Slow building carb that let's your palate get the whole spectrum. Mild tannic finish. D- I really enjoyed this beer. I've had the regular version and like it but the cedar has done some cool stuff. First time with a cedar aged beer so I don't have much of a flavor comparison but this is super tasty. I would have easily been able to take on a whole bottle. Ill have to get another one soon. A- Pours a hazy dark orange with a two finger white head with good retention. A few lines of lacing are left behind. S- Earthy oak upfront followed by red apples, lemon juice, grapefruit, orange and a hint of caramel malt. T- Citrus notes with lemon, lime, orange and grapefruit as well as red apple, caramel malt and a strong oak flavor, which is a bit too harsh and overpowering. It did get a bit smoother as the beer warmed up a bit. M- Medium carbonation and body with a dry finish. O- This was as advertised with the oak being prominent in the aroma and taste. I did think it was a little too overpowering in the taste which hurt the drinkability, but certainly not a bad effort from CCB. I guess this is what I've got? It is a very hazy, dark honey color with a nice fluffy cream colored head that leaves wonderful lace as it recedes. A millimeter or so of film hangs out atop the beer as I drink it and it leaves nice sheets of lace. Smell is nice an hoppy -- lots of citrus hops in this one -- with some cedar and a hint of tobacco. Maybe I'm imagining that. but sweeter than a typical AIPA for sure. It smells delicious. This is a wonderfully mellow IPA! It's got a lot of big hop flavor but the bitterness is really well smoothed out. The cedar imparts a nice bright woodiness to it, and there really is some tobaccoey character, but it doesn't taste like a cigarette -- it's a spicy character, more like fresh tobacco smells, in a way? A nice bitter finish has me reaching for the glass again. A bit sticky and oily on the palate, with a medium body and a moderate and creamy carbonation. Slightly dry at the finish. A little too easy to drink, but worth lingering over. Switching to a regular AIPA after this should be interesting. Had this on my visit to Cigar City. Served in a pint glass. A: darkish orange color, a bit opaque. Very small head that managed to stay for quite a while. Good lacing. S: cedar, pines, oak, hints of herbal and citric notes. Very nice but this smell wasn't as strong as the regular bottled Jai Alai IPA I've tried previously which I thought it was a bit weird. T: follows the nose with a woody taste, hops, citric hints, a touch of spicyness as well that doesn't get in the way. Everything is very balanced, nothing offensive. Amazing taste for an IPA. M: medium carbonation. Finishes off excellently and smoothly; goes down well for being an IPA. O: no wonder this is one of Cigar City's award winning beers. If you are into IPAs this is a must-have. Heck, even if you're not a big IPA fan (like myself) you should definitely try this amazing beer. 750mL bottle courtesy of jdubfl poured into a tulip. Pours a deep, hazy brownish orange with a big creamy white head that shows fantastic retention and remains a one-inch head for the duration. Lacing is impressive as well with sheets of sticky lace all the way down. The aroma is not too different from the original Jai Alai with a dominant fruity citrus aroma with hints of pine and a nice caramel sweetness as well. The cedar is definitely present but not overpowering at all. The taste is where the cedar comes out a bit more. There's lots of juicy citrus up front but it gives way to a healthy caramel malt sweetness and a more prevalent spicy wood presence which lingers through the finish with a healthy dose of resinous hops. The mouthfeel is pretty full bodied and very sticky with hop juice. There is an interesting spiciness from the cedar as well which makes the mouthfeel more unique than most IPAs. This is a very impressive beer from Cigar City and I think it's better than the original, as the cedar really smooths things out and lends an earthiness to things. I'm not normally a fan of wood-aged IPAs, but this one really surprised me. Well done and one of the better IPAs I've tasted in recent memory. hazy orange color with a big white creamy head thick and sticky lacing. floral notes, strong cedar, and citrus. maybe a little apricot. taste is the same but much more dry, and even has a little funk to it. mouthfeel is lightly carbonated and very creamy with a medium body. very light and not too filing, the flavor does not coat your palete. high drinkability. quite a good beer and i could see this going well with a nice cedary stogie. Poured into a Sierra Nevada pint glass. No freshness date on the label or bottle but the sticker put on by the liquor store says 12/22/2011. A- Pours a dark amber color with a one and a half finger head that retains like a champ before finally residing at a 1/4 inch head with nice lacing and spots of foam on the surface indicating healthy yeast. S- Oh God. Smells like literally stepping into a humidor. Wood-laced tobacco aroma that blends beautifully with fresh, peppery hops. T- It's like taking a bite out of a cigar box which I view as a good thing. Massive rushes of black pepper and cedar which suit the particular types of hops used to perfection. M- Prickly and a bit dry but it doesn't bring the drinkability down at all. High carbonation also helps round out the flavor profile to its excellent standing. O- It just doesn't get much better than this. Even my girlfriend, who almost never likes IPAs, enjoys the hell out of this. 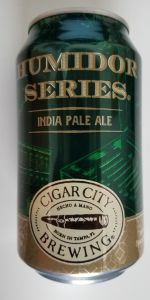 This was the first Cigar City brew I ever had and it was love at first sip.